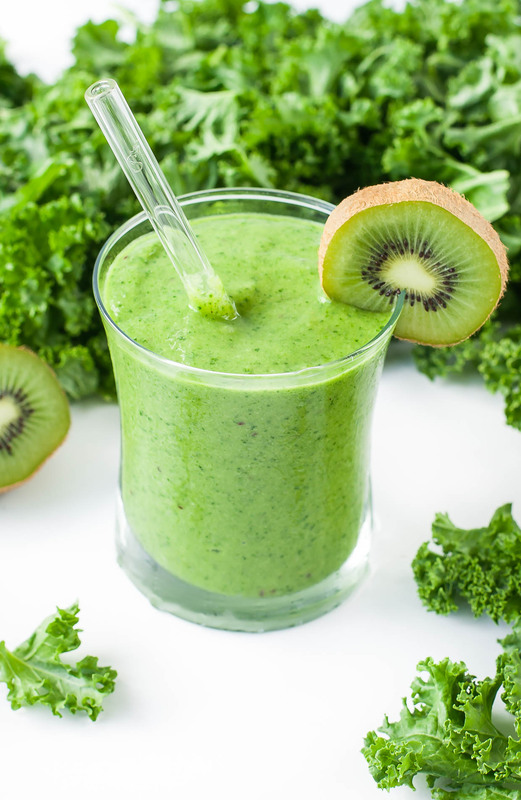 Boasting 2 cups of kale, this Tropical Mango Kale Smoothie is nutrient-packed and full of tasty tropical flavor. Shake up your smoothie routine with this gorgeous green smoothie! There’s been a long-standing rule in this house: no two smoothies shall be alike! Though this clearly makes me a contender for lamest rule in all the land, I’m 100% okay with it! My smoothie game is uber spontaneous and I rarely re-create my blended bombshells a second time. I’ll always add something different like a new fruit, a boatload of veggies, or a bevvy of mix-ins like chia, hemp, flax, or protein powder. It’s simple enough, use up whatever is on hand and you’re sure to have endless smoothie combinations to slurp all Spring and Summer long. Until now. Now I’m on a kale bender. It started innocently enough, with a light rotation of leafy green salads, but things escalated rather quickly. Now simply eating it isn’t enough. I have to drink it too! I like to prep the whole bunch of kale after purchasing it, and love know that I’ll have a big ole bag full to add to my salads all week long. It outlasts all other lettuce. Where iceberg, romaine, and even my beloved spinach will wilt and/or brown, kale has my back. I’ll simply wash and dry thoroughly, remove the leaves from the stems, massage the leaves to tenderize them, then store it in a plastic baggie with a square of paper towel to help keep it fresh. I’m so crazy in love with my latest creation that I want it daily. Hourly even. A bit obsessive? Probably. Do I care? Nope! It’s too flipping hot outside to fight the urge any longer. 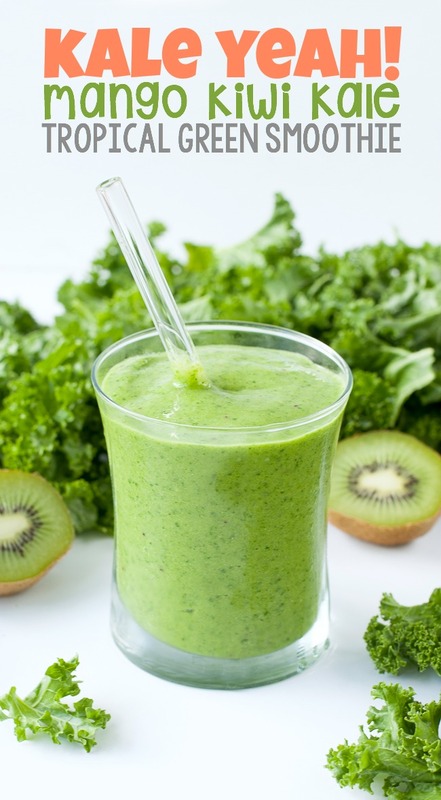 Shake up your smoothie routine with this gorgeous green smoothie. 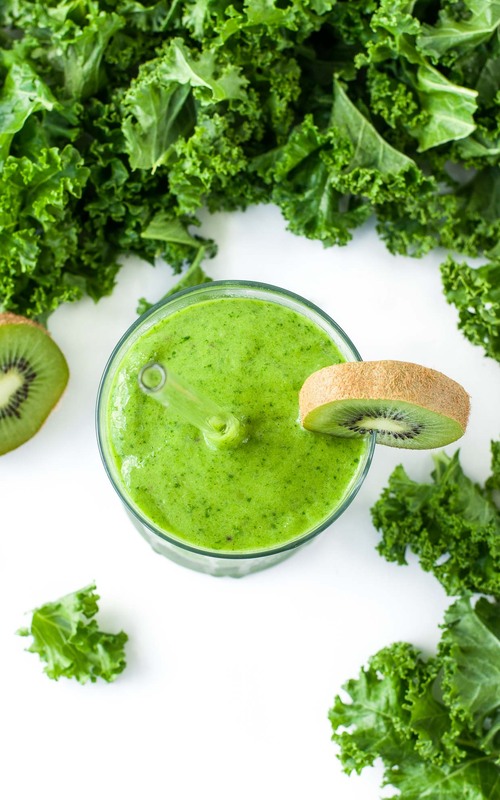 Boasting 2 cups of kale, this Tropical Mango Kale Smoothie is nutrient-packed and full of tasty tropical flavor! Blend! Blend it. Blend it real good! That's it! Using a blender or processor, combine above ingredients and blend into green smoothie perfection. 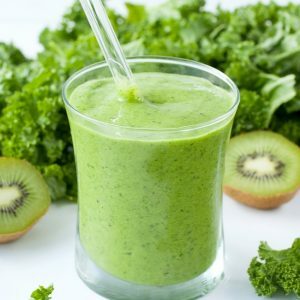 The longer you blend the kale the more it will break up, and the thickness will greatly depend on the ingredients used. Since I used frozen mango and coconut milk, my smoothie was super thick yet still easy to drink through my favorite glass straw. If you only have fresh mango handy, consider using frozen banana to thicken. Use the above recipe as a guide then adjust to taste as needed. New to kale? Consider adding a bit more mango to kale ratio and then working your way up as needed. Easy peasy! Feeling fancy? Serve with extra kiwi slices to garnish! When choosing a coconut milk, keep flavor preference in mind. Canned coconut milk will have a tun of rich coconut flavor and add some healthy fats to the mix! Refrigerated cartons of coconut milk are delicious and lower in fat/calories than traditional coconut milk. They also lack the strong coconut flavor. I used a carton of coconut milk since that's what I typically have on hand, either will work! Of course I’m always running out of ingredients, so naturally this bad boy can be shaken up into a few fabulous combinations. No coconut milk handy? Try coconut water! Not a fan of c-nuts? Not a problem! Fresh orange or pineapple juice make great substitutions for the liquid portion of this smoothie. You can even use mango juice or carrot juice (or mango-carrot juice because, duh) and blend away! The kale-banana-mango combination, however, is total magic. Try it! I’ll even let you sub spinach if you’re super scared of kale, because I’m nice like that. Just as long as you eat (or in this case, drink!) your veggies I’ll be happy! Though this sassy smoothie may be alarmingly (aka awesomely) green, the flavor is 100% banana-mango. It’s fruity and fabulous and oh-so-tasty! I love this smoothie’s face off. The end. Cheesy Kale Stuffed Sweet Potatoes – READER FAVORITE! We also LOVE this Strawberry Kale Salad! Yum! I love the combination of mango and kale. Can I also add some spinach? It for sure turns kale into something dreamy! I love smoothies and this has become one of my favourites. Thanks so much for the recipe. So happy you’re enjoying it Rosemary, thank you! Your recipe calls for “massaged kale”. What did you massage it with? Hey Sheila, great question! When I prep my kale I like to do a big batch for the week and keep it in a baggie with a square of paper towel. After washing I let it dry completely and massage it with my hands to tenderize the kale. This was delicious! Sometimes when I put kale in smoothies it makes it bitter. But,This recipe with kale is great ! It had just the right amount of creaminess and sweetness and tartness AND it’s still so nutritious with the kale. It’s been my go to green smoothie this month. Thank you! What about almond milk instead of coconut milk? I love putting kale in smoothies! I also put the smoothie mix in reusable popsicle molds for my kids….they love it and I love that they’re getting their veggies!! So yummy! Definitely need to try this one. I’ve been in a rut with my smoothies lately and I think this is the perfet pick me up. I pick up my first CSA share of the season on Thursday. I’m super hopeful I get kale so I can make one (or twelve) of these. Cheers my friend. 2 cups of kale? Impressive! This looks perfect for a Monday after a weekend of too much junk. The more kale the better!